On a field Vert, an octopus Purpure holds a five-point coronet Sable. The colour green stands for the House's flourishing ranch activities. 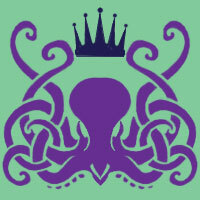 The octopus signifies not only their main industry but the many interwoven arms of influence they employ to support the interests of Rebman Royalty. A minor noble House, Dafydd is not particularly well-situated in terms of property or industry. What they do have is political influence and a head for directing (and clogging) the flow of favours up and down the food chain. A number of ranking functionaries in Moire's government were tied to Dafydd, particularly Lord Servalle, former ambassador to Amber. They also have a reputation for ambitiously, aggressively, shamelessly, marrying off all available, eligible, and undeniably attractive, members in politically advantageous unions with Rebma's Great Houses as well as nobility of Amber, and powers in the Golden Circle. Dafydd's history is short, having been raised to the peerage within living memory. The current Countess, Meiriona, is the eldest child of the House's founder. The deed that led to Dafydd's ennoblement was done in the earliest days of Moire's reign, when a scandal involving a pretender to the Throne was thwarted by a sharp-eyed clerk. Dafydd's ancestral home is an octopus and eel ranch adjacent to House Morfilod's holdings, near the Minoan border. Tesni Dafydd runs the ranch and has seen modest success in food exports to Amber and the Golden Circle. While calamari and eel make delicious dishes, the Dafydds, impressed by the trainable intelligence and lovable personalities of molluscs in particular, have perhaps unwisely marketed some of their stock as potential household pets, as well. Public opinions on this move are divided. House members performing bureaucratic duties in the capital tend to take a room at the Dafydds' small town estate located on one of the Upper City plateaus. Compared to House Dilwen, they are mere dabblers in Alchemy, but the major supplier of octopus ink for dye, medicine, and pest repellent. Due to the close proximity of their ancestral territories, there has always been an understanding of mutual interest and neighbourly defence between the Dafydds and Morfilods. The House's standing with the Rebman Crown is currently good. Martin had been patient with their attempts to hook him up with one or another attractive noble daughter, but now that he is officially engaged to the Princess of Tir, they have abandoned the prospect and gone back to being more productive in their meetings with the Regent. The Dafydds, and therefore Rebma, have Princess Deirdre's support, due to her son Phaedrus's marriage to Countess Meiriona. Currently none. BG hooks to House Dafydd to be discussed with Propco Martin. Heulwen - Given to Karm of Amber via marriage contract; deceased in childbirth. Leyson - Former Majordomo of the Rebman Embassy. Mostyn - Another former Majordomo of the Rebman Embassy. He is unusually fond of paperwork, orderly organization, and the noble octopus. Servalle - Deceased former Ambassador to Amber, eldest brother of the current Countess. Taliesin - A son of Lord Bauquemare, seer of dark things, vanished around the rising of Leviathan. Dylan - A son of Lord Bauquemare, but not involved in the workings of the House. Meiriona, the Countess is also a notable general of Rebma's armed forces. She is married to a son of Princess Deirdre. Tesni, the youngest sister of the Countess. Mostyn and Heulwen's mother. Phaedrus, Meiriona's husband, Count Dafydd, and a Lord of Amber. Known philanderer. Avril, son of Phaedrus and Meiriona, died at roughly 13 years of age in the aftershocks from the dying of Rebma's Pattern.